“Instagram makes photos prettier. Molome makes photos funnier.” This is the selling point of Thailand-based mobile photo startup Molome. However, Molome wasn’t all that different from Instagram right at the very start. It actually started in 2011 as a pure mobile photo-sharing service with filters, positioning itself an an alternative to Instagram on the platforms that the latter wasn’t available on — Android, Symbian and BlackBerry — which are also the operating systems most widely used in emerging countries. CEO and co-founder Chaiyos ‘Arthur’ Chaiyamanon tells TNW that stickers only came into the picture in late 2012 — and that is when the service went through a fundamental change. “We observed that our users — even without stickers (on Molome) — found a way to add their own stickers using some other apps anyway,” Chaiyamanon says. He notes that after the introduction of stickers, Molome became noticeably more popular as more users came onto the service. Stickers are larger-scale emoticons primarily used for instant messaging (IM) chats, which Molome has in this case used for adding on to photos. They are popular among users, particularly in Asia, because they help convey emotion in a more visual way. The addition of stickers makes it easy for Molome to tout itself as a meme creator, but I think the fun part about it is adding a cute touch to photos that may otherwise look bland. Using Molome is easy — take a photo, choose to filter it if you want to, then drag and drop components including stickers and text onto the photo, and you’re done. Chaiyamanon explains that right now, Molome simply doesn’t treat Instagram as a competitor — after all, in Molome you can also share your photos to Instagram. Instead, Molome exists to make the photos you share more interesting and funnier. And it seems like they’re attracting a large number of young Internet users seeking the next cool app. Since its launch 30 months ago, Molome now has a total of 1.4 million registered users and 100,000 monthly active users. About 20,000 photos are uploaded daily onto Molome. The service may never reach Instagram’s popularity with a user base of 150 million users, but Molome is a fun alternative for those who prefer their photos more fun and less arty. There is a timeline where you can see your friends’ activity on Molome, and a popular page just like Instagram that features photos which have been ‘loved’ the most — so as to drive user engagement. Chaiyamanon says that Molome was started as a fun side project but it gradually grew more popular, and they had to seek funding in order to meet the costs of maintenance, which is how they ended up being part of accelerator JFDI Asia’s third class. In terms of future monetization plans, Chaiyamanon says that in the next two to three years, advertising will probably form the bulk of Molome’s revenue. The company hasn’t started taking in advertisers yet as it wants to tread carefully to prevent annoying their users (just like how Instagram has held off on ads till it decides upon a right timing), but currently it is testing brand-sponsored stickers. Users can access these stickers from brands, and in the midst of it, brands are reaching out to their customers. Chaiyamanon says that Molome will also soon feature in-app virtual goods, where premium content can be purchased. Some day, Molome will also sell virtual hugs and kisses, as well as flowers so “users can express more emotions,” he explains. The Molome team will use any funding it receives to hire community managers to respond to users in different countries, Chaiyamanon tells us. This means Molome can effectively roll out special stickers to celebrate an occasion, such as Father’s Day which varies country to country — and this will keep users more bonded to the service. 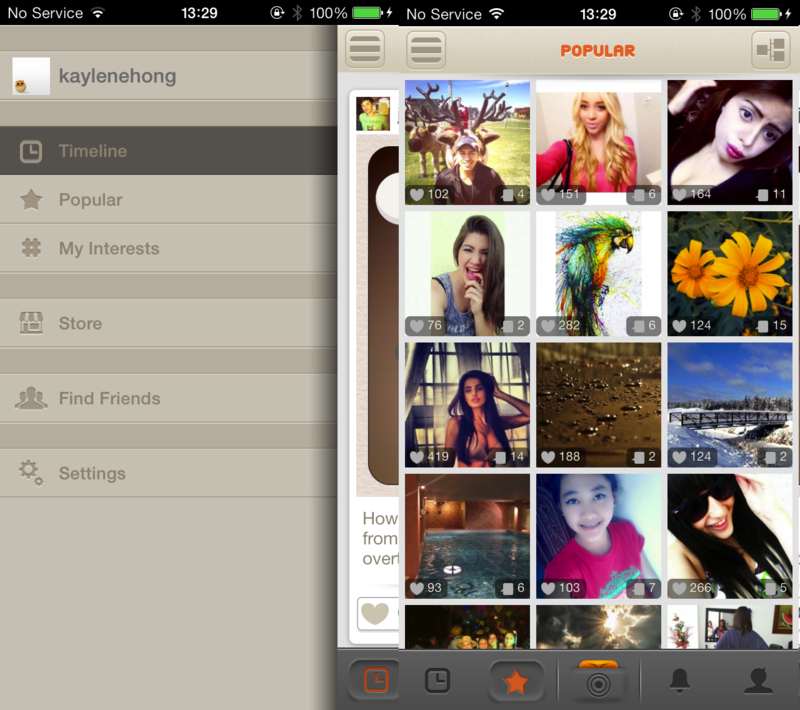 Currently, emerging markets form a big part of Molome’s audience — which is probably what sets it apart from Instagram. Thailand, Brazil, Indonesia, the Philippines and Venezuela are the top five sources of Molome users. Chaiyamanon explains that young people in emerging countries are still using Nokia and BlackBerry phones, therefore Molome is well-placed to tap on that particular market. Furthermore, Chaiyamanon observes that in emerging markets the culture is very different from America — they seem to have more emotional attachment to these images and will want to decorate them instead of just filtering and sharing them. The Molome team thinks that essentially, users treat Instagram as a platform to share photos, instead of decorating their photos. 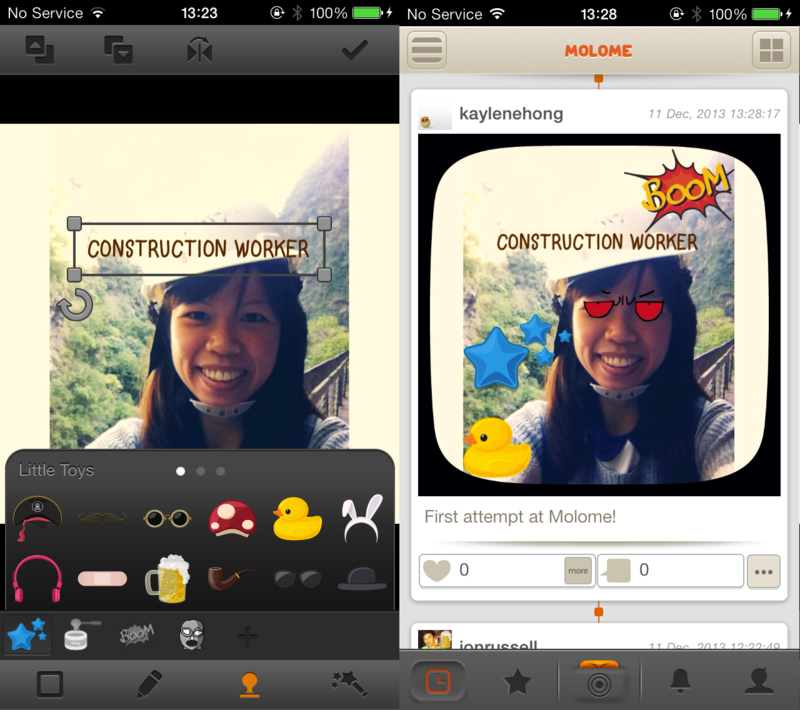 Molome can thus be viewed as a combination of Instagram and sticker apps, with a focus on emerging markets. “The core value that we see (for Molome) is something that people can use in their everyday lives. We see people doing photos as part of their life, and we just want to make it fun,” Chaiyamanon says.